Standex Current Sensors Keep Frozen Drinks at Optimal Consistency - When companies need to deliver their delicious frozen drink concoctions at just the right consistency, they rely on Standex Electronics current-sense transformers. By understanding the process first, and then designing a product to those parameters, our engineers determined that monitoring current draw was a more effective means of achieving product consistency than measuring temperature. Agitator paddles draw more current as the drink mixture freezes. Monitoring current draw (with a Standex Electronics current sensor) allows us to stop and the restart the refrigerant flow (with a Standex Electronics custom transformer) to maintain proper consistency — with far more accuracy than merely monitoring temperature.We do not employ a "make it fit" mentality but rather design to your parameters. Whether that means unique current draw, special voltage outputs or constrained footprint parameters, Standex Electronics engineers take it all in stride. 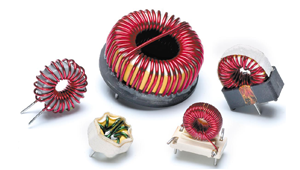 We can deliver basic transformer coils, add leads and wiring harnesses, even add additional components to complete the assembly, and then over-mold or pot them so that the final product is impervious to the elements.Don't let your demanding HVAC/R application cause your blood to boil. Call Standex Electronics — we'll have you "chilling" in no time!